Neighborhood cleanups not only have a very tangible, beautiful result, but also create a sense of unity, friendship, and community among the neighbors participating. 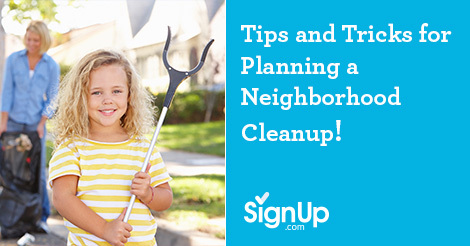 With careful planning and the help of SignUp.com anyone can set up a successful neighborhood cleanup! If you’re spearheading the charge to clean up your community, the first thing you should do after setting the date for the cleanup is to set up a SignUp on SignUp.com. The service is free and customizable—allowing you to list every task you can think of for the event. (Common items include having groups pick up trash, reclaim overgrown spaces, haul large trash items, remove graffiti and plant flowers and shrubs.) Participants can access the site from their smart phones and computers, and once they’ve chosen how they want to pitch in, they receive automated reminders and the event is added to their eCalendars. Next, publicize the event and post the SignUp link through your neighborhood association’s listserv, social network or newsletter. Publicity is key to finding volunteers and ensuring that everyone is aware of the cleanup day. Post flyers in local stores, libraries, schools, and churches, and make sure you include the link to the SignUp sheet. One of the best aspects of a neighborhood cleanup is that participants of all ages are welcome to join in: no one is too old or too young to help. Families often find that involving kids in a neighborhood cleanup is a great way to teach children the importance of community and working together. On your SignUp, be sure to list items for donations of food and supplies. Those people who are unable to help with the actual cleanup can still contribute to the cause by donating supplies for the cleanup and refreshments for the after party. You’ll need trash bags, gloves, rakes, shovels and flats of flowers for starters. After the trash has been collected and disposed of and the volunteers have finished their hard work, it’s time to celebrate with a party. Add items to your SignUp to solicit donations for the party after you’ve determined an ideal venue—perhaps a nearby park that you’ve just cleaned! Local businesses may donate goods, drinks, and other supplies since they are benefiting from the improvement in the neighborhood. Pro Tip: If your neighborhood is a good size, you might seek volunteers from Scout troops and student service groups, as well as media coverage for your event which will increase participation and interest from the community at large!